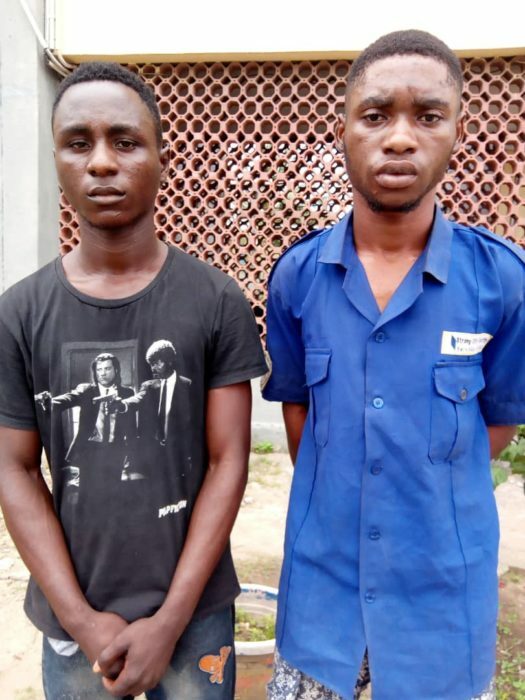 The Lagos State Police Command is investigating two security guards, Kingsley Okon Asuquo, 19 and Isaac Edet, 18, assigned to guard a Lagos lawyer, Prof. McCarty Mbadugha, from Strongcity Security Services but ended up attacking and robbing the same man who hired them for protective services. A statement issued by the Police Public Relations Officer, PPRO, Chike Oti, said the Command had on October 13, 2018, at about 5:30pm, received information from a credible source that armed bandits held one Barrister Joseph Mbadugha aka Prof McCarty Mbadugha, hostage in his office at JohnVic Igbanogo Street, Lekki Phase one, Lagos and that the armed men were seen wearing Strongcity Security Services uniform. “Based on the information, operatives from Maroko Police Station and FSARS Ikeja, jointly mobilised to the scene. On sighting the operatives, the hoodlums ran in different directions to avoid being arrested but one of them, who gave his name as Isaac Edet, was nabbed at the scene. “During interrogation, he mentioned and led detectives to arrest his partner in crime, one Kingsley Asuquo. Interestingly, both suspects are staff of Strongcity Security Services attached to the victim. They claimed the victim does not pay their salary as at when due, hence they planned with others at large to rob him,” he explained. Oti said the suspects succeeded in dispossessing the victim of a bag containing laptop computer, cash sum of N40,000.00, three cheque booklets and one iPhone-6, saying all these items were recovered from the thieves in the course of investigation. He said the Commissioner of Police, Edgal Imohimi had directed the head of the Command’s Intelligence Unit to fish out the suspects at large for prosecution. “The Command hopes that this press release halts the rumour making the rounds on the social media that the lawyer was attacked by unknown assailants,” he said.